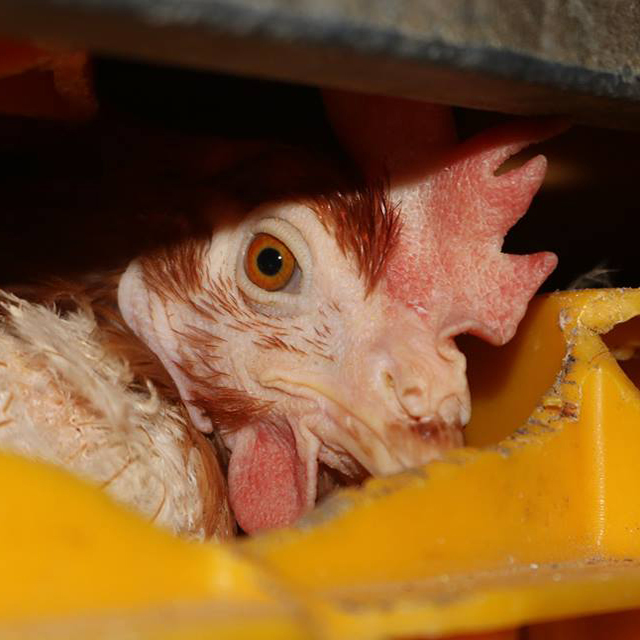 Cara is a very special little hen---as she is one of the few survivors of the commercial egg industry. 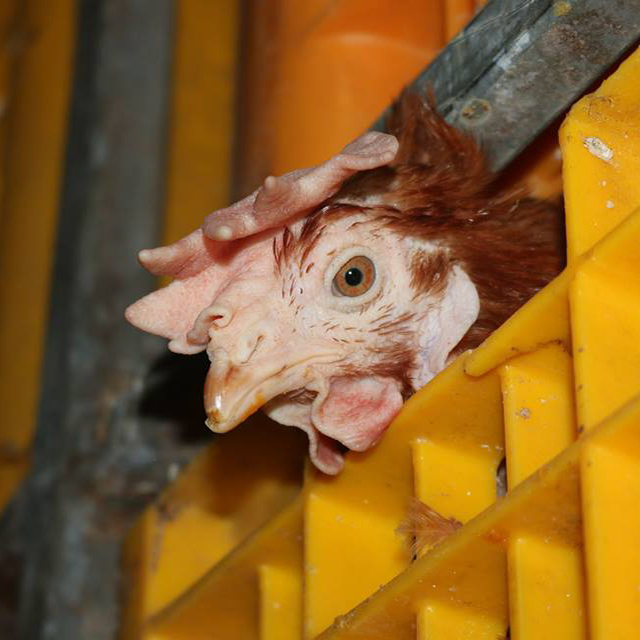 She has survived unimaginable cruelty and torture, inflicted upon her by this industry. However, what makes Cara absolutely amazing is that despite it all----she still wants to live! 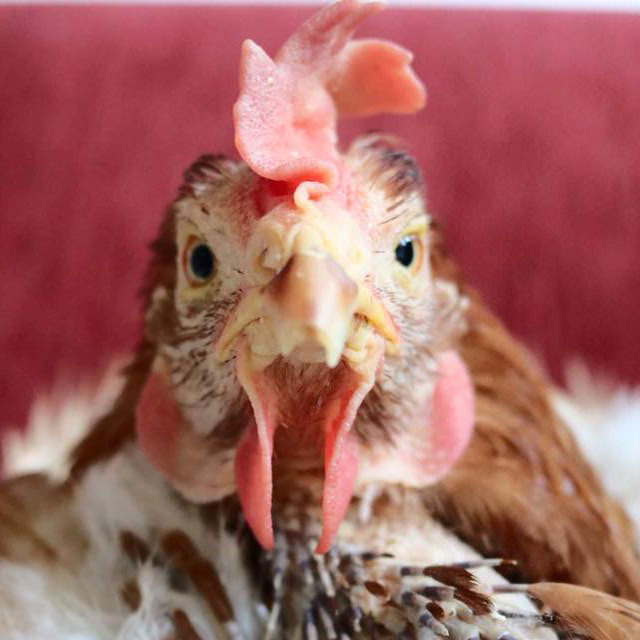 Cara was rescued by Dreamer’s Hen Rescue from certain death by slaughter in February 2017. When Cara was found, at first her body shook with fear when she felt one of the volunteer’s wrap her hands around her thin, fragile body---for each time before when she had felt hands, they inflicted pain to her body. The last hands she felt had gripped her legs so tightly that she felt her bones’ shatter. As she was flung into the air and then landed with such force on her bony, non-feathered wing that caused it to shatter. As she felt more and more hen’s pile on top of her, she felt her lower body start to give out. The sad truth is that the workers hired by the egg companies actually treat the hens’ worst then most manufactured, non-living objects. At least LED television sets are protected and handled by workers with care so they don’t shatter. The people working for the egg companies, don’t care if they shatter a hen’s leg, rip off her wing, or crush her small fragile little body. This is why statistics show that over 90% of these “spent hens” that even make it to be slaughtered, have at least one or more broken or missing body parts. Cara’s body was found with little to no feathers. Gradually, due to the unsanitary conditions, excessive stress, and malnutrition---she had lost all of her feathers---leaving her cold and shivering. Her wings, once covered in beautiful brown feathers, were now nothing but broken spines. If you didn’t know better, when you looked at her, you might wonder if she was already dead. Thankfully, Cara was not dead. 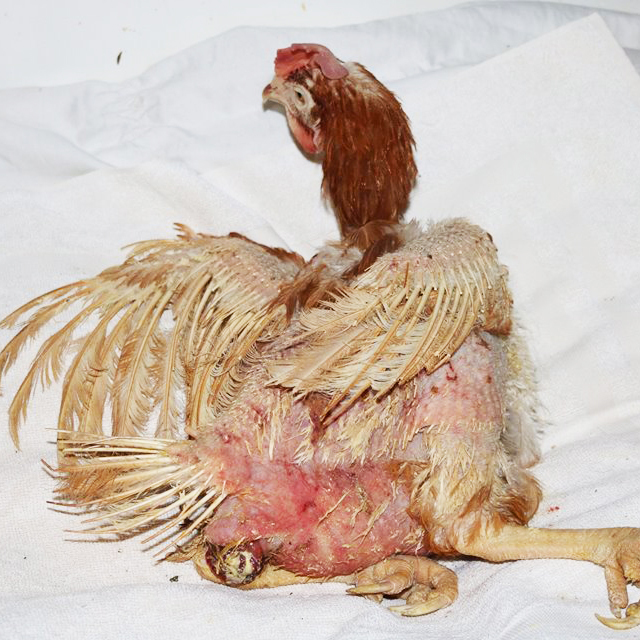 Despite having multiple fractures in both her legs and one of her wings, almost all of her feathers missing from her starved fragile little body, and uterine prolapse---she still kept fighting for her life. 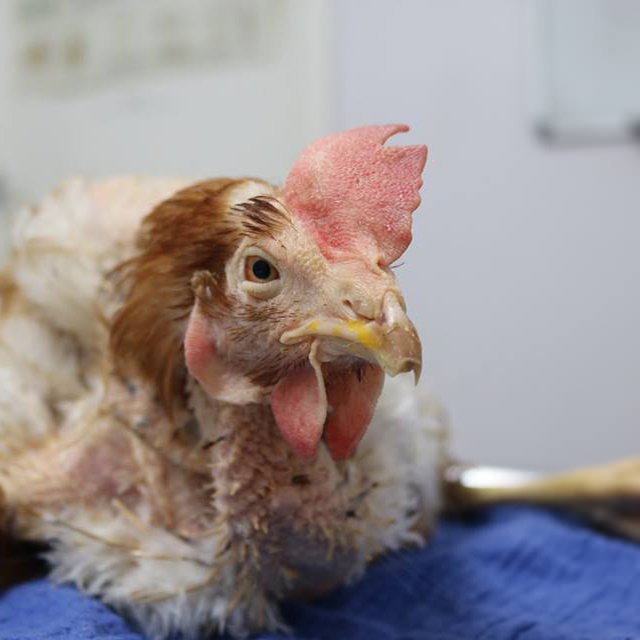 As soon Dreamer’s Hen Rescue had Cara and looked into her sweet face, they made her a promise. They promised Cara that if she kept fighting for her life, that they would never give up on her. They would nurse her back to health and provide her with the best veterinary care possible, because every day she spends free from captivity, is a day worth fighting for. Cara had endured the worst of human kind, and now Dreamer’s Hen was determined to show her the very best. Cara recovered from surgery in her wheelchair at Bird Vet Melbourne, to fix her two broken legs, broken wing, and prolapsed cloaca. Cara finally gets to feel what it is like to be loved and cared for. She was spoiled at the vet so now she has a real hankering for fresh fruit over grains, which is hilarious to her loving humans who rescued her, but they figure that she can have whatever she likes. She still cannot stand on her own, but she’s only 2 weeks post-surgery, so it’s not a concern as of yet. 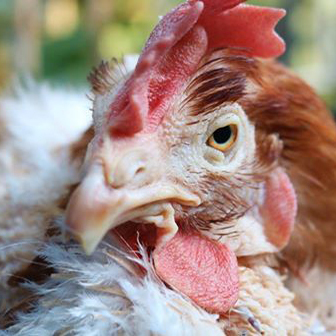 Dreamer’s Hen Rescue (DHR) is an animal rights organization located in Australia that is dedicated to rescuing, rehabilitating and rehoming farmed animals, predominantly chickens. The organization was named after Dreamer, a rescued hen who they will forever hold dear in their heart, for she dreamed of a better world---a world where people choose kindness over cruelty. 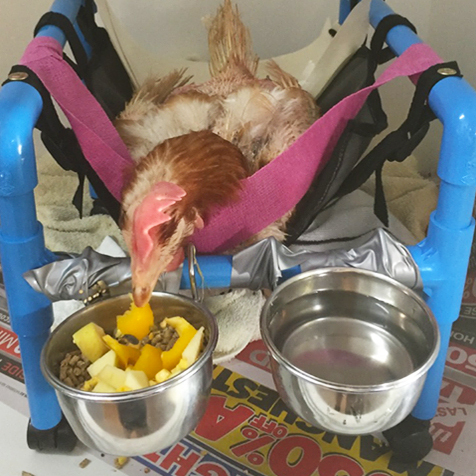 Chicken Therapy Chairs was started up by the kind friend and volunteer that assisted Dreamer's Hen Rescue with Cara. 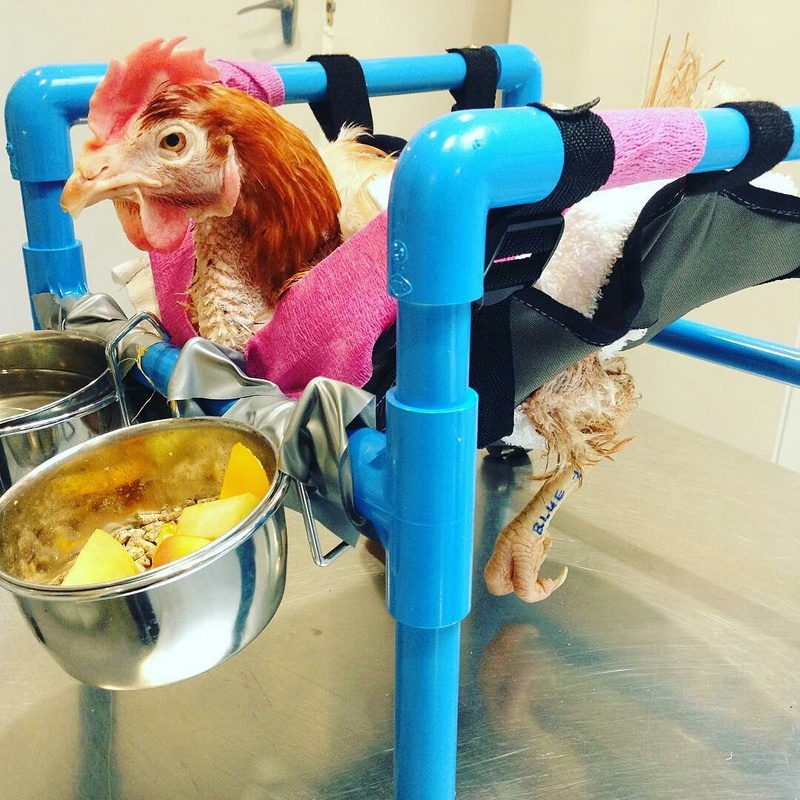 Because she received so many inquires about the wheelchair she had made for Cara, she decided that she would try selling them to others--so that their chickens can also benefit similar to Cara. 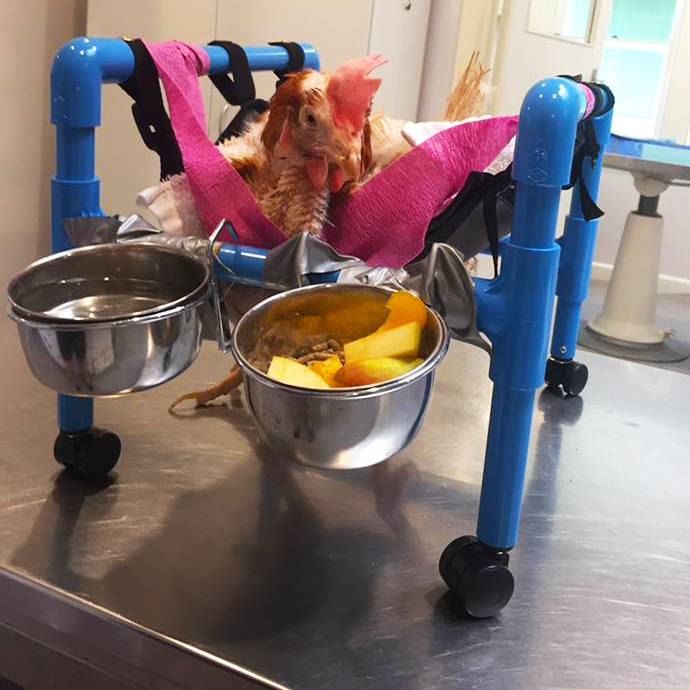 The chairs are designed to assist in the recovery & rehabilitation of chickens experiencing injury, disability or post-surgical procedures. Bird Vet Melbourne (BVM) is a full service veterinary hospital that specializes in all avian species-- -anything from exotic parrots, finches and canaries to backyard chickens. The hospital is outfitted with the latest medical technology and equipment. BVM is located in south eastern Melbourne, Australia and open 7 days a week. BVM is passionate about bird health and welfare, and their entire staff are highly trained and experienced working with birds. Dr. Phil Sacks is the owner of BVM, and he works alongside Dr. Michelle Sutherland and Dr. Esther Yuen. Drs Sacks and Sutherland have postgraduate qualifications in avian medicine (Membership of the Australian and New Zealand College of Veterinary Scientists (MANZCVS)), and Dr. Sutherland will be sitting examinations to become a specialist in avian medicine in 2018. Dr. Yuen is currently training towards her MANZCVS qualifications.